A wedding symbolizes a couple’s love for one another. Coming together in this union shows the world you’re committed to each other, and want to spend the rest of your life together. Every anniversary after provides a chance to relive the wonderful times the two of you have enjoyed together as a couple, and reaffirm why you started this journey. Once you reach your 50th anniversary, it’s a time for celebration and love. After all, fifty years together as couple is a huge moment. Like most people, you will want to throw a huge party to celebrate the lucky couple and wish them luck on for many more years to come. Getting the ball rolling on this extravaganza means sending out 50th wedding anniversary invitations, to all concerned. The 50th is the Golden Anniversary, and each who makes it this far is normally quite proud once they make it there. It is at this anniversary party that all the people in the couple’s lives, will come together and enjoy everyone’s company. The love and commitment that it takes to make it to this point, is something few people will ever realize, with people getting married later and later in modern lives. Send out the 50th wedding anniversary invitations with pride, and let the world know this is an occasion worth celebrating. Creating the special 50th wedding anniversary invitations will require a bit of planning. Typically, the couple in question doesn’t actually do the invites, or host the party. In many cases the Golden Anniversary party is a surprise to the couple (even if they were in fact expecting it.) 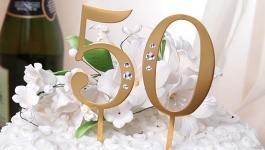 Try to summarize what will happen at the party, whether the couple will be renewing their vows (again if they are actually ‘aware’ of the party), whether or not drinks and food will be provided to guests, and any other stipulations…should all be included in the 50th wedding anniversary invitations. Organizing a renewal of vows is a great idea, and many guest will be more interested in making it to the function, if it involves a “ceremony” of sorts–similar to feeling obligated to attend the original wedding. Before you make the 50th wedding anniversary invitations, try at least to determine how many invites you need to send out. How many friends does this couple really have? This may require some sneaking around, while utilizing some Private Investigator skills you never knew you had. You can have the designs created and purchased at a specialty shop, or you can consider buying a template and creating the invites online–which is a very affordable choice. All that is required with the online option is for you to choose and purchase the appropriate paper for the occasion. This will all come down to the numbers–50 years is a long time, and no doubt the couple has created many friends and family in that time. It’s best to find out what sort of “scope” of people you’re dealing with first.